The Surface looks little like a notebook. It doesn’t sell with a keyboard and trackpad. What you get is a slate with a kickstand and the digital equivalent of a pen. This hardly sounds like a device that could replace a computer, but it unequivocally is the notebook of tomorrow. Microsoft has made this year’s Surface a better tablet. The slate has been shaved down to 8mm because going any thinner would result in the omission of a USB port. A weight of 786 grams deems it a heavier tablet than usual, but the Surface Pro 4 holds more promise. Inside is the kind of hardware reserved for high end notebooks and personal computers. There’s a sixth generation Intel processor, be it an m3, core i5 or core i7, up to 16-gigabytes of RAM and hard drives up to a terabyte in capacity. The hybrid runs Windows 10 and has been designed to take advantage of the updated operating system. Comparing it to an iPad or an Android tablet would be inaccurate. 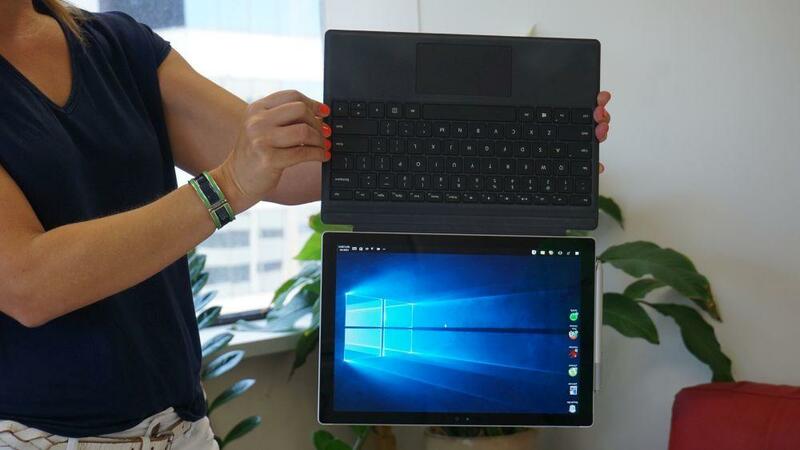 It competes against devices such as Apple’s MacBook and rivalling notebooks running Windows. Significant improvements have been made to the tablet’s screen. The 12.3-inch display is larger without the Pro 4 being any bigger because it eats into the space formerly taken up by the bezel. It’s a sharp screen with a resolution of 2736x1824 and a pixel density of 267 pixels-per-inch. Bordering the display are two stereo speakers in the guise of inconspicuous slits carved into the Gorilla glass. The sound quality is better than expected from such a compact device. YouTube dialogue can be discerned easily and the playback of music is loud enough to rival that of a notebook. Commendable performance gives the impression the small speaker grilles are offset by decent chambers. Movies can be enjoyed on the Surface Pro 4. The screen’s high resolution provides plenty of detail, blacks are wholesome and brightness levels are strong. Most reflections are softened, but an office’s fluorescent lighting remains more of a bother on it than Apple’s iPad Air 2. Freehand writing on the Surface feels natural. The Gorilla Glass 4 coating the screen is the thinnest of any tablet at 0.4mm. It is bonded to the LCD to bridge the gap between what you see and what you touch. Then there’s Microsoft’s PixelSense technology, which combines a dedicated imaging chipset with the backlight, so that the tablet can optimise how the touchscreen works by recognising the difference between a finger and a stylus. The battery-powered stylus holds charge for a year. Picking it up switches it on and docking it powers it down. A strong magnet is used to dock the stylus effectively enough for Microsoft to create a ‘clipboard’ mode. 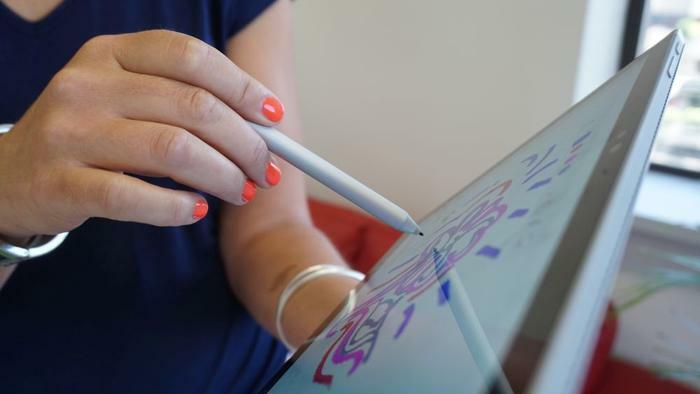 Microsoft’s Stylus bears an uncanny familiarity to an ordinary pen. Virtual ink flows with the same consistency due to the Stylus’ 1024 levels of gradation. Mistakes can be retracted by flipping the pen around and using the ‘eraser’. It is no coincidence the tablet is the same size as a sheet of A4 paper. Pen and paper has long been the best way to jot down thoughts. Writing on the Surface feels natural because it conforms to the lifetime practice. Some benefits come from digitising the writing experience. The button on the stylus can be used to launch different applications. OneNote opens when it is pressed down once, but hold it and Microsoft’s personal assistant, Cortana, will be readied. Then there’s the handwriting recognition software, which works well to transcribe questionable penmanship into typeface. Another improvement has to do with the omission of the capacitive Microsoft button on the tablet’s face; removing it means it can no longer be pressed accidentally. The mechanical keys of the keyboard are backlit. Anyone buying a Surface Pro 4 should set aside $199 for the Keyboard Cover accessory. Factor it into the cost of purchase because it is what elevates this tablet into a worthwhile notebook alternative. Strong magnets fix the keyboard cover to the Surface Pro 4. One magnet locks it in place, while a second gives it some elevation so that it is easier to type on. The strength of these magnets plant the keyboard firmly so that it feels little different to the that of a notebook. Long typing sessions can be comfortably had, partially because the keys are spaced, but mostly because they have a long 1.5mm travel. This is the kind of setup that can be used to type on for a whole nine hour day, and that’s more than can be said of the redesigned keyboard on Apple’s 2015 MacBook. Upholding the high standard set by the keyboard is a capacitive trackpad. It is 40 per cent larger than last year’s model and it takes advantage of the multi-finger gestures baked into Windows 10. 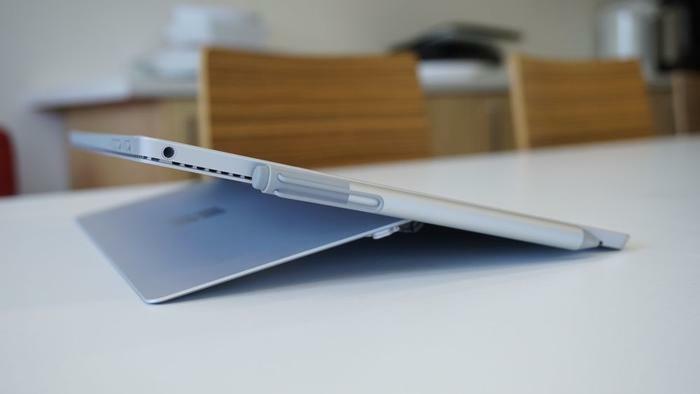 The trackpad can compete with those featured on dedicated notebooks. 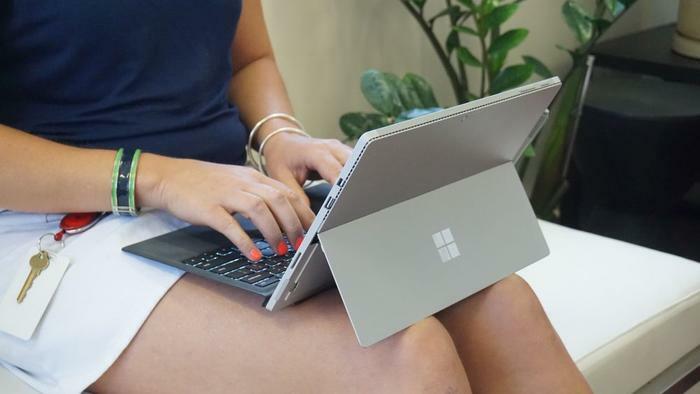 Bundle the keyboard with the Surface Pro 4 and the two measure 13mm in thickness and weigh 1.1 kilograms, placing it in contention with the popular ultrabook standard. Remaining unchanged is the kickstand. 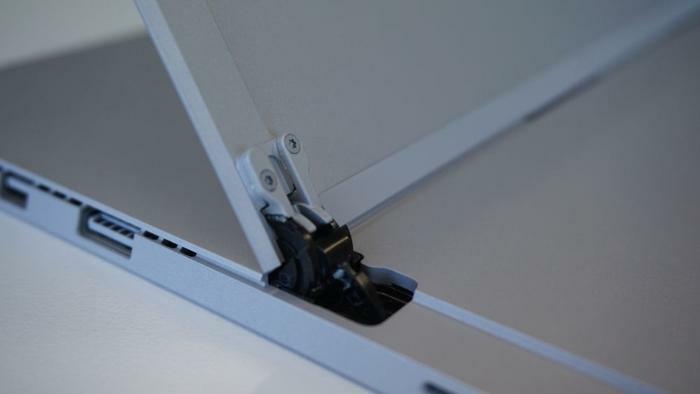 This is the unsung hero of the Surface Pro 4’s unique form factor because it makes it possible to tailor viewing and typing angles. The kickstand contorts to a wide variety of angles with little effort. Its range starts at an almost upright 90 degrees and it extends to one that is near flat. The Pro 4 shipped for review featured an Intel core i5 processor running at 2.4GHz (turbo boost up to 3GHz), 8GB of RAM and a 256GB hard drive. The tablet-notebook ships with Windows 10 Pro and has an Australian retail price of $1999, or $2,198.95 when bundled with the keyboard cover. This hardware is ideal for office professionals, people who spend their days sending emails, working in word or excel documents, surfing the Internet and rely on programs running a full version of Windows. 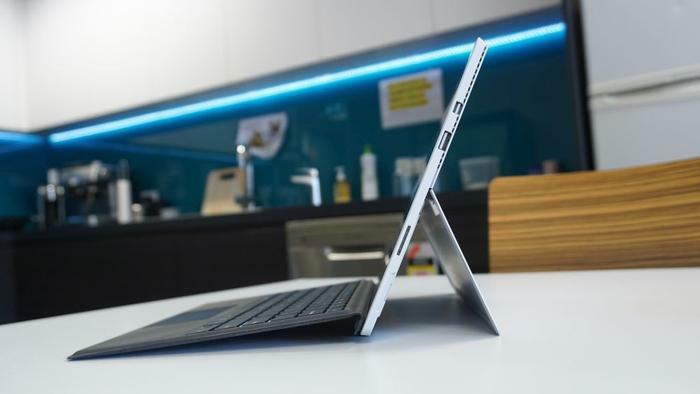 Benchmarking tests revealed a notable performance improvement over last year’s Surface Pro 3. Rendering the popular Ring demo in Blender3D was completed in 2min59 seconds, an improvement of 30 seconds over the Pro 3. Fast storage transfer speeds were achieved using CrystalDiskMark with read speeds of 1496 megabytes per second (MB/s), which is more than three times faster than the Pro 3, and write speeds at 307.5MB/s. Professionals reliant on Photoshop or CAD modelling software will find the Surface Book better suited to their needs as it comes with a dedicated graphics card. Light games can be played on the Surface Pro 4 using its integrated Intel HD 520 graphics, but gaming is not its intended usage scenario. In 3DMark, the tablet-notebook scored 49,930 in Ice Storm, 5,737in Cloud Gate, 3,501 in Sky diver and 842 in Fire strike, all of which represent a notable improvement over last year’s Surface Pro 3. The Pro 4 runs silent more often than not, but when it is being pushed, by tasks as intensive as gaming or rendering, the fans grow audible. Air is channeled through vents bordering the top of its frame and it can sound reminiscent of heavy rain. Overall battery life represents an improvement. Microsoft claims the Pro 4 can loop a video continuously for nine hours. PCWorld’s intensive battery test is designed to identify how long a tablet or notebook will last in the real world. We maxed the brightness, enabled Wi-Fi and looped a Full HD video until the battery life had drained. This happened after 6 hours and 4 minutes, which is a better result than the Surface Pro 3 (5 hours and 46 minutes) and the Apple MacBook (5 hours and 42 minutes). 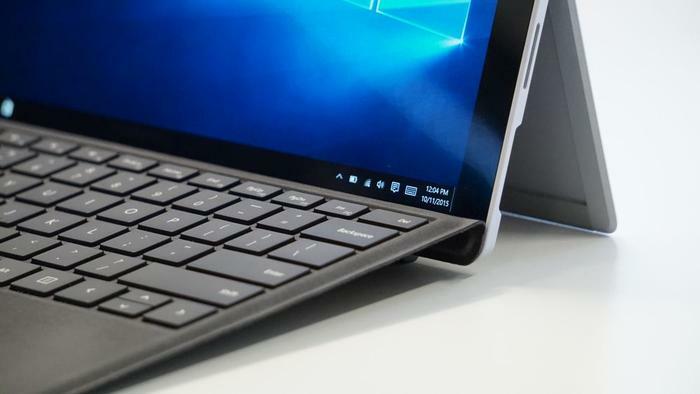 Microsoft set out to make a tablet that can replace your notebook with the first-generation Surface, but it truly realised its ambition with the Surface Pro 4. The original design stems from what we need from a notebook today. It needs to be as mobile as it is powerful, as beautiful as it is functional, as simple as it is sophisticated. The Surface Pro 4 is all these things. One device that is a tablet; one device that is a notebook.